Collection Red showcases the talents of artists from the former Soviet Union. A new group of artists will open their third collective exhibition to coincide with Russian art week in London this June. “Summer Fusion” includes colourful works by Russian artists with diverse styles and backgrounds. Flowers and fruit might seem like innocent subjects, but the members of this group are individual and original. Olga Geoghegan, whose oil paintings imbue ordinary objects with iconic significance, was born in Ukhta in the Russian North and specialised in art at the Leningrad Academy when she was just ten years old. She later studied under Maly theatre-designer, Eduard Kochergin, whose memoirs were published in English last year. In works like “Pumpkin, Fish and Flower” Geoghegan uses pale colours and empty expanses to give her still lives a disconcerting subtlety. Hrayr Karapetian from Armeina creates mythical scenes in tempera on cardboard, while visiting artist Sergei Orlov favours lurid neo-primitivism. From Shandor Zicherman’s cubism to Jurij Grigorovich’s impressionist London landscapes, this exhibition of works by Collection Red and their guests is nothing if not varied. 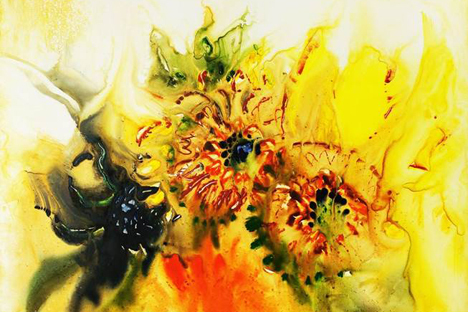 “Summer Fusion” is on show in Kensington from June 4th-13th. More information at Collection Red.